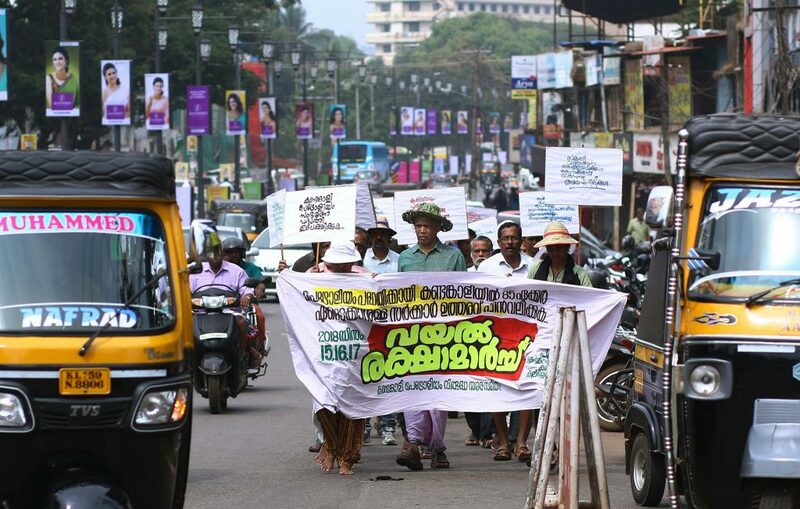 A month after 1000s walked the roads of the capital city of Thiruvananthapuram in a SORROWFUL MARCH to express their dissent about the upcoming Waste to Energy plant near their homes at Peringamala, Kerala saw 3 more rallying together of people for just and relevant causes. 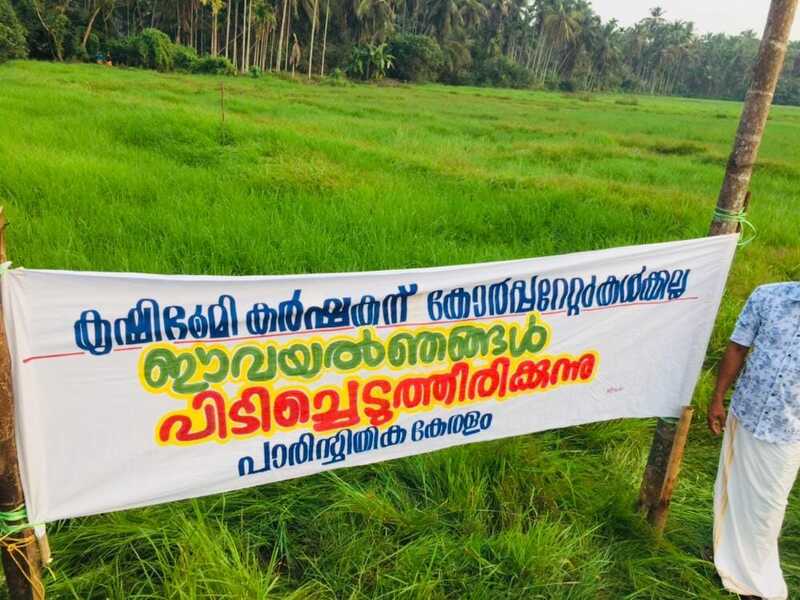 The Kandankali paddy land near Payannur has been in the heat of debate as the proposed project of Hindustan Petroleum Corporation and Indian Oil Corporation will affect 129 acres of land which includes 77 acres of paddy fields, unique biodiversity rich mangrove forests and wetlands. Along with this the common user facility and storage terminal meant to ease supply requirements for middle and northern districts will be located close to schools, hospitals, worship places and areas frequented by the local population. Earlier this year, the District Collector has convened a People’s meeting where all concerns and studies regarding the feasibility of the project were put on board including the ecological services of the ecosystems affected, the livelihood disruption of farming community, the impact on already depleting water resources, the food security of the region and so on. The Collector declared that there is no active farming community in this region. 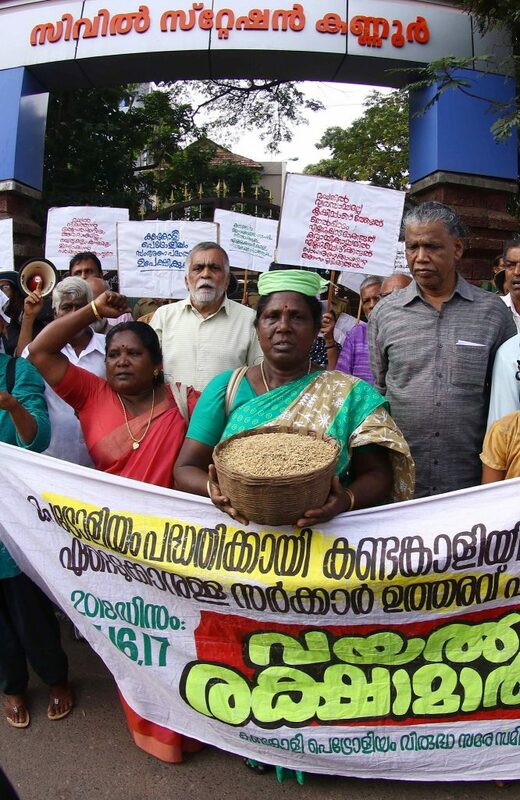 As an answer to this declaration, the people of Kandankali who walked the distance to Kannur Collectorate from Dec 15-17 carried a basket full of paddy that was reaped in the harvest this season! It is a sad and terrible fall out of the shocking amendment that was made in February 2018 to the Kerala Paddy land and Wetland Conservation Act of 2008. Knowing very well that one hectare of wetland stores 1 million litres of water especially in the context of the drought and water scarcity that Kerala has been facing since 2 decades and also that we have reclaimed 30% of our wetlands that has caused the cycle of floods and droughts in the region, we have created this trap called development! The issues that Kandakali raises are complex….it is an intricate mix of ecological services that wetlands play along with the diverse livelihood options that agriculture creates in the region. It is also worth reconsidering the fallacy and danger of setting up of a storage facility for a substance like diesel in a heavily populated, water rich area. Especially when foresees a future weaned away from fossil fuels in these harsh times of Climate Change. 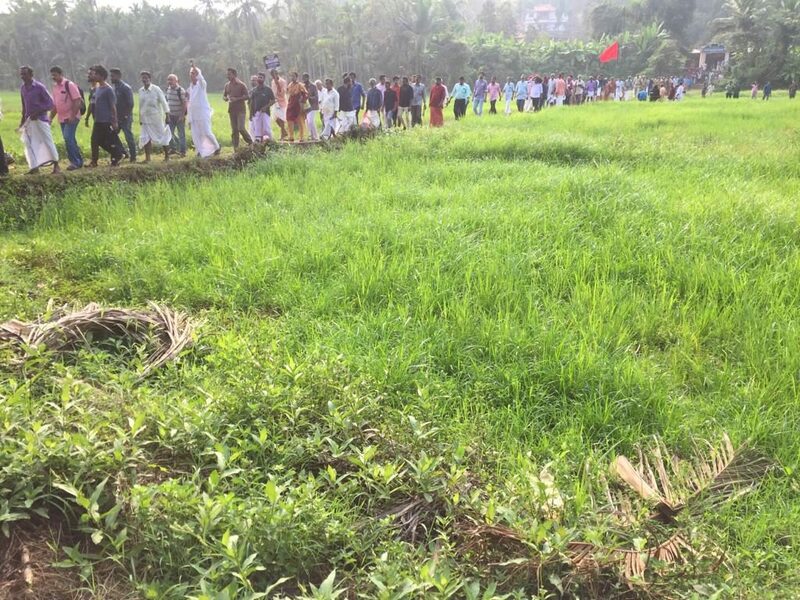 Quite close by in Thaliparambu, the much heard of struggle by the Paddy birds ( Vayalkilikal) caught attention from 2017 onwards. In this case the villain is a bypass of the National Highway that will remove “traffic snarls” in the region. The bypass which is 6 kilometers long will cut through the heart of the 29.11 hectare land with over 21.09 hectares being paddy fields. The Kuttikal- Koovodu- Keezhattur bypass will have to create an elevation of 3 metres for the land that is 250 feet deep and nestling between 3 hills..for this 2.6 million tons of soil will be needed which may be brought in by breaking down hills and creating havoc elsewhere! The farmers who have been for generations living in harmony with the soil and water are aghast at the recent NHAI 3G notification that demands immediate take over of land. The Notification spells the death knell for 90metres of Keezhattur paddy land across which the 45 metre 4 lane road will be constructed. It is indeed unjust that inspite of a study by Kerala Sastra Sahitya Parishad ( March 2018) that enquired into alternate ways in which by pass can be constructed including with a flyover that will save the paddy field, the Kerala Government in tandem with the Central Government is bend up on this killer road. The people at the lead of the movement who have been staunch supporters of the ruling CPM are more shocked by the disdain and resentment with which the Government is ignoring their protest…which has been termed “unwanted “. There is little or no space for dialogue and consensus and a slogan on the road by the local left supporters says it all-We will reclaim paddy fields, bull doze hills, We need DEVELOPMENT “ ..the people of Keezhattur ask in one voice “ Is harming our livelihood and environment Development?” The water rich paddy fields and wetlands of this region also assures perennial water supply for the whole of Taliparambu municipality. In the case of Keezhattur struggle, the complex play of politics has made the situation worse. The NHAI plans for road development decided by the Central Government along with the development paradigm of the ruling Left in the State have left the people in the lurch ! In both the cases, inspite of impacts on sensitive, fragile and endangered ecosystems like wetlands, mangroves, rivers and paddy fields, no comprehensive Environmental Impact Assessments or mandatory Public Hearings have been conducted. 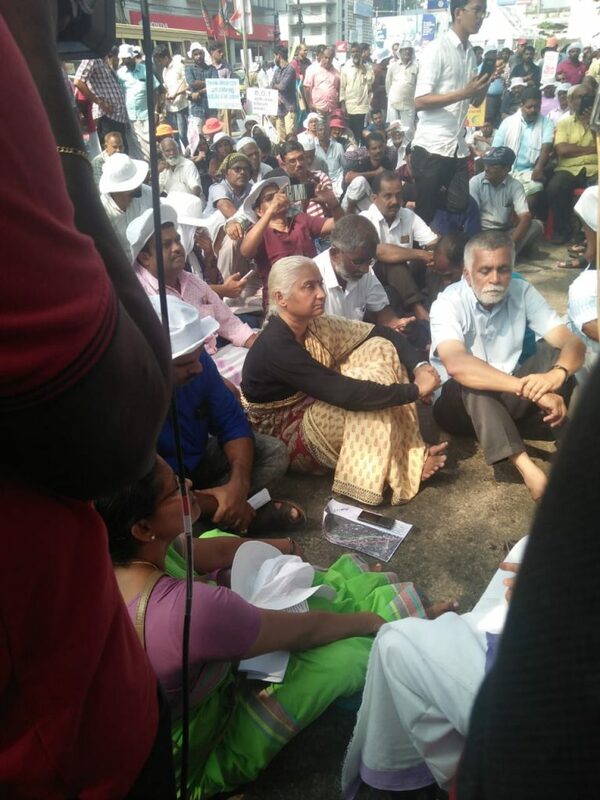 The procedures have followed an unjust, undemocratic, non-participatory centralized mode,much against the lauded claim that Kerala model of development follows a Decentralised, Participatory, Bottom-up mode. Along with this, the economics of food security that such extensive farm lands offer to the State’s financial process has been treated with negligence and disrespect. All of this is against the modern, humanist, people centric innovative development garb that we are wearing. Along with this, the streets of the capital city saw a huge rally against the 45 metre widening of the National Highway that will throw lakhs of people from their land, homes and occupation /livelihood. On Dec 20th, the people came as organized teams from all over Kerala who will be affected again by the increase in width of the highway. Apart from the ecological impact of the highway that will fragment life sustaining ecosystems all along its trajectory, the high way will also cause untold social, cultural and economic disruption and disintegration. It is for these crucial issues that touch the lives and livelihood of many that we need to form fences that are live and pulsating with the smell and breath of communities living in close bonds with Nature. We need to break the concrete walls which has been proven in the floods of August 2018 to impede rescue operations and cause damage to life. We need to make live, breathing fences of flowering plants that let in air and fragrance..and do not cut away communication and sharing of new ideas and thoughts. The sensitive and subtle ecological knowledge and wisdom of the people especially women who touch the Earth and feel the changes need to be brought to the fore.The floods have taught us so much about our insensitivity and ecological illiteracy – we need to slow down, observe and note the lessons that Nature is offering free and in abundance all around. For that we need to be with the people of Peringamala, Kandankali, Keezhattur and the huge mass displaced by the highway. 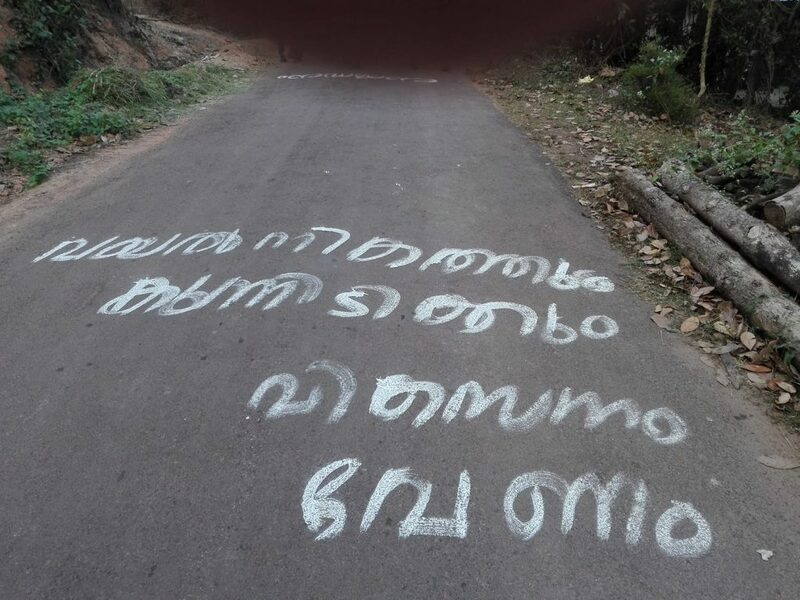 Their NO echoes in one frequency all over Kerala..we cannot turn deaf to them because soon we too will be targeted!